KESENNUMA, Japan – The government of Japan is so incredibly well-organized, and its workforce so amazingly inspired these days, that Japan’s economy will actually perform better than it did last year, despite the country’s suffering its worst disasters since the World War II. That’s the underlying logic of an International Monetary Fund report that says Japan’s economy should grow – yes, grow – by 1.4% this year. That is down only slightly from the 1.6% forecast three months ago,before the March 11 earthquake and tsunami in northeast Japan. Kudos to the IMF for standing shoulder-to-shoulder with Japan in its darkest hours, and for trying to rally investors behind a noble cause. But a cold look around the zone obliterated by the March 11 earthquake and tsunami strongly suggests that consumer demand, manufacturing output, farming production and exports will likely see dramatic declines this year, at the very least. The Japanese Cabinet Office, continuing the government’s banal downplaying of the disasters, says the Japanese economy “has shown weakness”. This “weakness” might have something to do with about 500,000 people suddenly having no homes, jobs or possessions; power shortages affecting 50 million people; the devastation of the entire northeastern coastline of Honshu; and 360 ships reportedly floating aimlessly in the ocean, while larger numbers of vessels still sit atop cars, houses, hillsides and in streets. And not to mention ongoing radiation leaks that threaten the food chain and scare away foreign investors, tourists and expatriate workers. Faced with these staggering figures, Economic and Fiscal Policy Minister Kaoru Yosano would only say the disaster’s effect on the economy has been larger than previously thought, when he should probably say straight out that Japan is too broke to fix itself and needs to call back much of the foreign aid it has given developing nations. The Bank of Japan, never known for its transparency and candor, last week warned that the disasters will exert “strong downward pressure” on the world’s third-largest economy. The IMF, however, is somehow bullish on Japan, raising its forecast for growth in 2012 to 2.1%, up 0.3 percentage points from earlier estimates. It did however warn that government debt, at present over 200% of GDP, could climb to nearly 230% this year. In contrast, Japan’s own Economic Planning Association poll of 43 economists showed that, on average, they expect the economy to contract 2.83% on an annualized basis in the April to June quarter compared with the previous year. For this fiscal year ending March 2012, they see meager growth of 0.44%. The association operates under the jurisdiction of the Cabinet Office. Have IMF officials been sleeping on floors in cold shelters among crying orphans and suffering seniors? If so, they might notice some of the “weakness” the government is seeing. The entire northeastern fishing industry, the lifeblood of coastal communities that provided 25% of the country’s seafood products, was wiped out, and the potential impact of nuclear contamination on fisheries nationwide is hard to immediately measure. 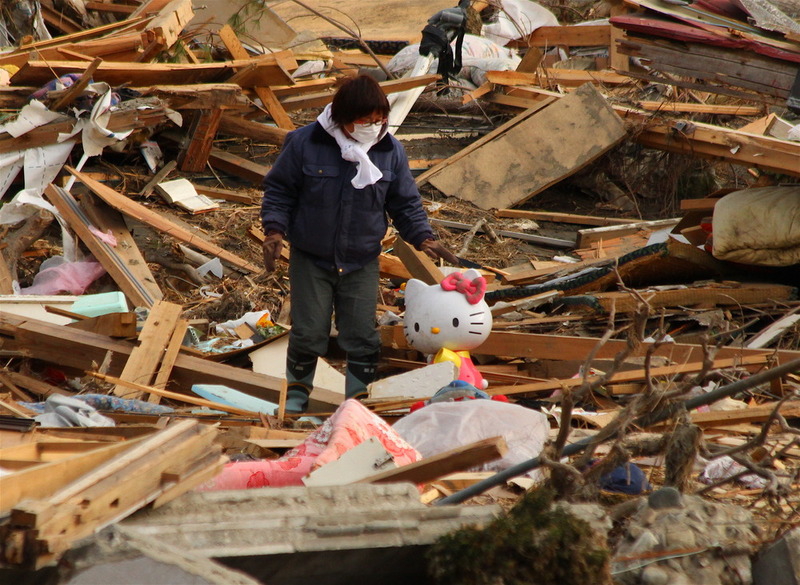 Shipping in the affected area will likely be impossible for months at least because ships, cars, homes and other debris clog harbors along a 600 kilometer strip from Hachinohe in Aomori prefecture to Ibaraki prefecture closer to Tokyo. 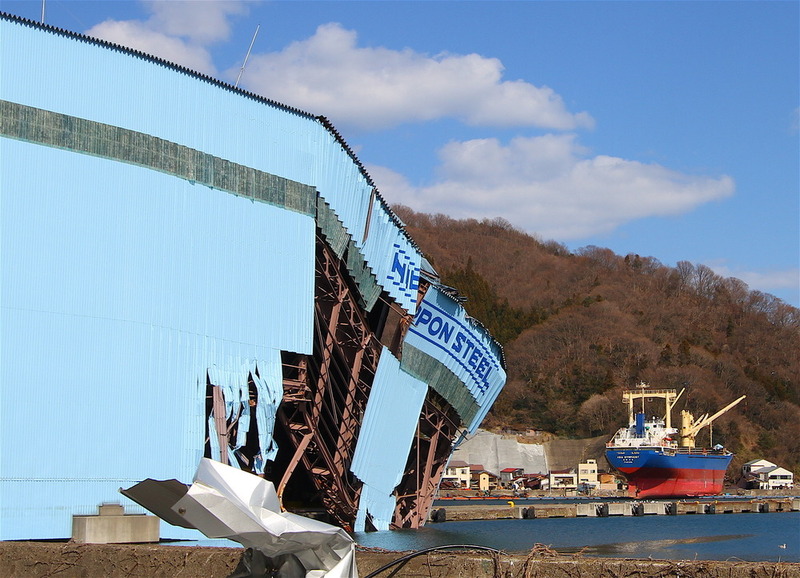 In Kamaishi, the self-styled home of Japan’s iron ore sector, Nippon Steel’s building partly fell into the bay. The plant’s massive steel yard has become a dump for debris from the downtown core, where 10-meter high sea surges gutted every home and business and tore apart a massive grainery and the world’s strongest seawall, among other objects which the Pacific Ocean considers minor obstacles. 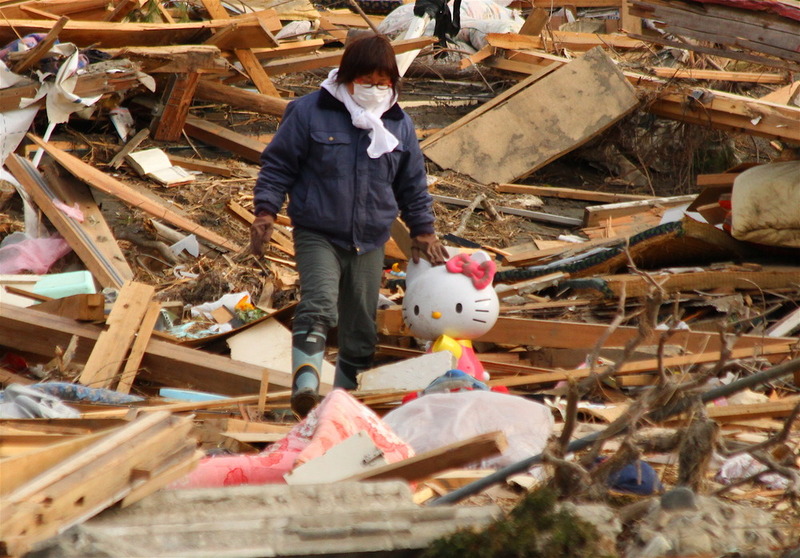 Instead of spending heavily on reconstruction, as happened in Kobe after the 1995 earthquake, a deeply indebted Japan might simply abandon many of the hardest-hit areas, such as Minami-Sanriku, Rikuzen-Takata and Otsuchi, and even parts of larger cities such as Ishinomaki, Kamaishi, and Kesennuma, where many locals told me they don’t want to move back. Why would they? They have no homes, no job prospects, and no faith that Tokyo is going to help them, especially since it took Prime Minister Naoto Kan three weeks just to visit them for a few hours. 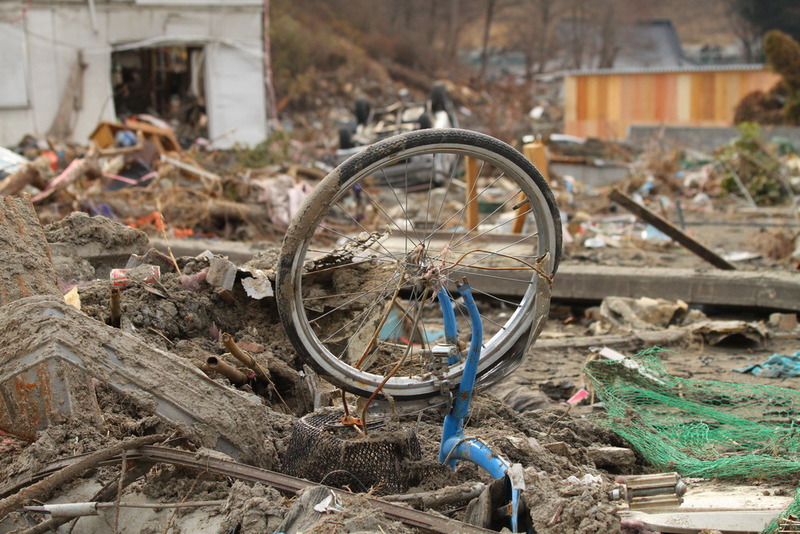 Who is going to drive reconstruction of the disaster zone? After the 1995 quake, Kobe was quickly rebuilt thanks to investments from its powerful business-minded neighbors in Osaka, and the deep pockets of Kobe residents on undamaged areas in Ashiya and Rokko. Northeastern Japan, however, was already the poorest region of the country, with incomes roughly half of Tokyo, and two jobseekers for every job offer. Devastated northeastern cities and towns have no wealthy neighbors; in fact, humble survivors often say their neighbors got it worse. Reconstruction requires human resources, not just pork-barrel spending on construction companies with yakuza connections. Many of the dead and missing – the number of which survivors fear is probably higher than the national police agency’s official total of about 30,000 – are not kids or seniors, as originally feared, but breadwinners in their 30s, 40s and 50s who tried to save others, gather valuables from their homes, or drive away in cars that now lie scattered across debris fields. A large percentage of survivors are kids too young to work, or seniors with no job prospects and no strong desire to rebuild in the final stages of their lives. The National Police Agency estimates at least 200,000 buildings were obliterated, meaning that many small and medium-sized enterprises were destroyed with them. An estimated 500,000 people lost homes, savings, businesses, and everything but the clothes on their backs. 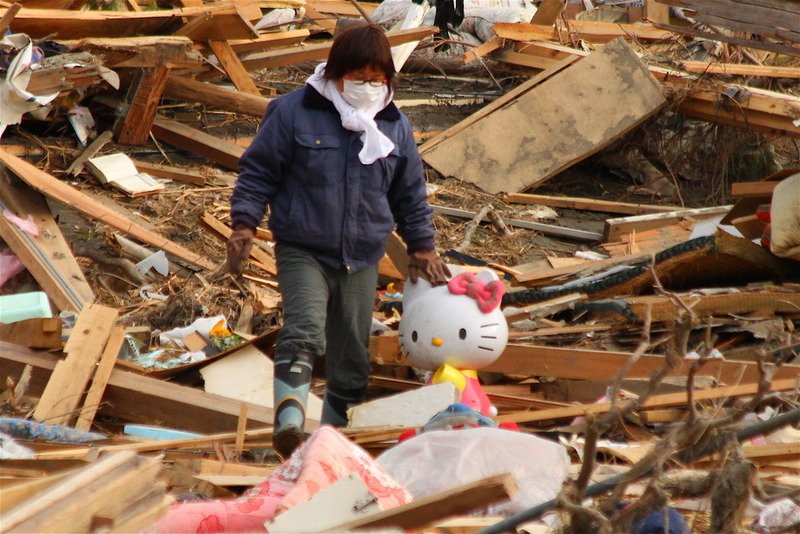 A month after the disaster, many of these people still have no money, not even 100 yen – or a little over a dollar. 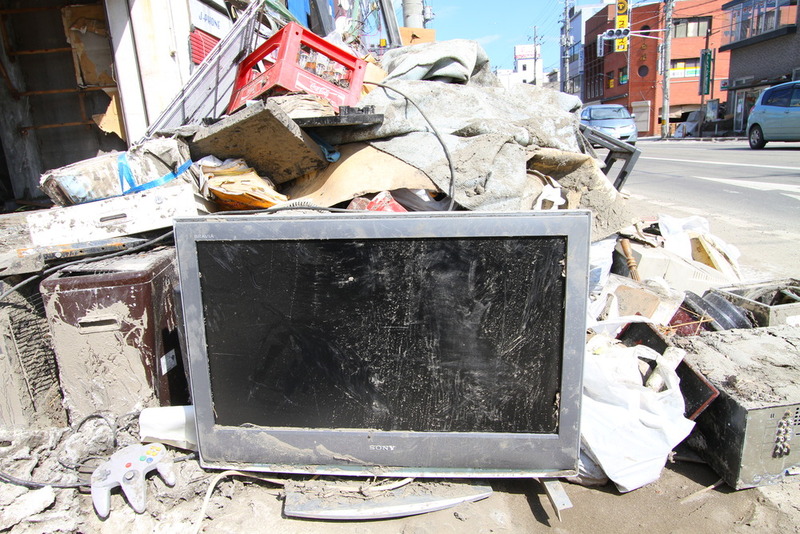 In the charred remains of Kesennuma city, for example, many parents, teachers and seafood industry workers have become scavengers, a new breed of dumpster divers desperate to find anything of value which they might be able to hawk for food. This sudden addition to Japan’s already swollen numbers of homeless and jobless poor will most likely result in a significant long-term drop in domestic demand nationwide, meaning reduced earnings for Japanese corporations, whose best and most loyal customers have always been Japanese within Japan. The Japan Automobile Dealers Association said last week that auto sales in Japan, excluding mini-vehicles, fell 37% in March from a year earlier. Trouble at nuclear reactors, meanwhile, will lead to long-term power shortages, since the island nation of Japan cannot import electricity via power lines to say Taiwan or South Korea. Even if manufacturers somehow become motivated enough to increase output, they could struggle to secure ample wattage of power. Formerly the world’s largest utility, TEPCO, which has lost more than 70% of its market capitalization, also faces trillions of yen in compensation pay-outs. Prime Minister Kan told the nation on Tuesday that Japan will get the reactors under control “at all costs”. This means the government will most likely end up spending money on cleanups and compensation instead of investing in wind and solar power, which many hope would save Japan from future nuclear nightmares. Tokyo’s economy, which is larger than Australia’s, is already feeling depressed, with escalators, elevators and lights in station switched off, and many people wary of going out to restaurants to eat fish and vegetables. Who wants to start a business in this climate? Even before March 11, Japan already had a chronic shortage of the type of entrepreneurs who revitalized Indonesia and Thailand after the 2004 tsunami, and no national leader has stepped forward calling for an increase in immigration. The one bright spot to emerge, so far, is the reopening of a runway to a few daily flights by Japan Airlines and All Nippon Airways at Sendai Airport. Yet full restoration of the north’s largest airport will take at least a year, according to Sendai Airport president Katsuhiko Ito, and portions of the terminal building, hangars and other areas are still caked in mud and surrounded by vehicles and debris. IMF deputy managing director Naoyuki Shinohara conceded there was “very high uncertainty” on Japan’s outlook and that the latest forecast “is one for the time being, based on the assumption that power shortages and supply chain disruptions will be resolved two to three months from now”. “If power shortages are prolonged, or if the situation at the nuclear plant deteriorates, the outlook will change. The current forecast is our main scenario, but the risk is firmly to the downside,” Reuters reported Shinohara saying on Wednesday. But if the IMF really aims to stand behind Japan, it should urge a massive international relief effort to assist a nation’s economy which, at the moment, resembles many of the survivors struggling to stay warm in the cold dark gyms of the disaster zone.